Crystal energy (also: noble electricity) is an universal energy form, which is extracted from Yeris radiation. Crystals energy is visible with the eyes as thin beam of particles and very dangerous when it isn't sufficient shielded. It's almost exclusively used by the Nazra, where it's used for all sorts of equipment and for the transfer of messages. The most important characteristic of this energy form are the differently colored crystals after which the energy was named. They can be used to redirect, divide, combine, collect and even store the noble electricity almost at will. Crystal energy is extracted from the Yeris radiation, also known as dark energy, as a result of the collapse of dark matter within a singularity. As the name implies, they're invisible and normally non-measurable physical quantities. In order to bring them into their usable form, Yeris radiation is bundled onto a transducer crystal, thereby the known crystal energy is emitted. Appropriate machinery are found in every larger agglomeration of the Nazra. These are up top 250 m high, symmetrically curved towers, whose tips leads into a transformation chamber. 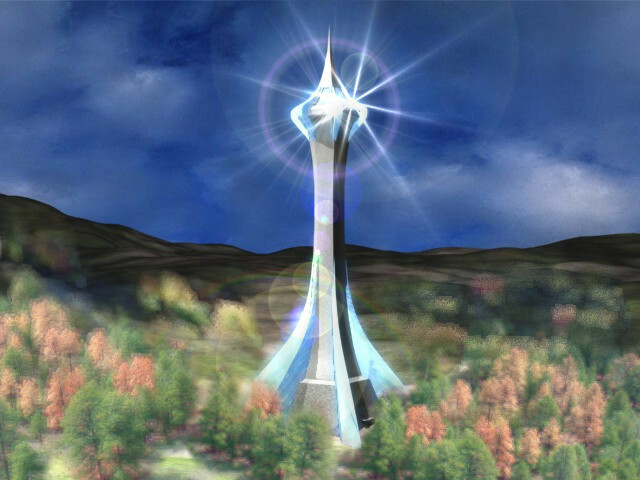 There's a transducer crystal, which absorbes the Yeris radiation and remits it vertically downwards through the tower as crystal energy. From there, the noble electricity is directed into the urban energy network by means of distribution crystals and stored in order to compensate utilization peaks. Because of their impressive size, the energy towers are usually the most conspicuous characteristic of a nazran city. Its luminous tip is also suitable as navigation point for seafarers. The culture of the Nazra is decisively shaped by crystal energy. Thus, all cities and larger villages are equipped with an underground energy network, which supplies the households with crystal energy. It's used privately for the operation of cutters, garbage shredders and transport platforms, but also in the city for night lightning or in public transport, to name a few examples. A second, important field of use for noble electricity is the reinforcement of forces. Nazra can use the crystal energy to strengthen their telepathic and telekinetic abilities. For this purpose, their Ya has shining ornaments which are able to store the energy and release it if necessary. White: Converter — converts Yeris radiation to noble electricity. Transparent: Handlebar — redirects incoming electricity in a different direction. Red: Separator — separates the energy beam into several new beams. Blue: Collector — combines several energy beams to one. Orange: Burner — transforms all energy into warmth. Green: Storage — storages noble electricity for later use. The capacity of the tanks depends on their size, density and purity. The energy is released again by a weak, centrally applied energy beam (comp. transistor).